Luminiferous aether or ether ("luminiferous", meaning "light-bearing"), was the postulated medium for the propagation of light. It was invoked to explain the ability of the apparently wave-based light to propagate through empty space, something that waves should not be able to do. The assumption of a spatial plenum of luminiferous aether, rather than a spatial vacuum, provided the theoretical medium that was required by wave theories of light. The aether hypothesis was the topic of considerable debate throughout its history, as it required the existence of an invisible and infinite material with no interaction with physical objects. As the nature of light was explored, especially in the 19th century, the physical qualities required of an aether became increasingly contradictory. By the late 1800s, the existence of the aether was being questioned, although there was no physical theory to replace it. The negative outcome of the Michelson–Morley experiment (1887) suggested that the aether did not exist, a finding that was confirmed in subsequent experiments through the 1920s. This led to considerable theoretical work to explain the propagation of light without an aether. A major breakthrough was the theory of relativity, which could explain why the experiment failed to see aether, but was more broadly interpreted to suggest that it was not needed. The Michelson-Morley experiment, along with the blackbody radiator and photoelectric effect, was a key experiment in the development of modern physics, which includes both relativity and quantum theory, the latter of which explains the wave-like nature of light. In the 17th century, Robert Boyle was a proponent of an aether hypothesis. According to Boyle, the aether consists of subtle particles, one sort of which explains the absence of vacuum and the mechanical interactions between bodies, and the other sort of which explains phenomena such as magnetism (and possibly gravity) that are, otherwise, inexplicable on the basis of purely mechanical interactions of macroscopic bodies, "though in the ether of the ancients there was nothing taken notice of but a diffused and very subtle substance; yet we are at present content to allow that there is always in the air a swarm of steams moving in a determinate course between the north pole and the south". Christiaan Huygens hypothesized that light is a wave propagating through an aether. He and Isaac Newton could only envision light waves as being longitudinal, propagating like sound and other mechanical waves in fluids. However, longitudinal waves necessarily have only one form for a given propagation direction, rather than two polarizations like transverse wave. Thus, longitudinal waves can not explain birefringence, in which two polarizations of light are refracted differently by a crystal. In addition, Newton rejected light as waves in a medium because such a medium would have to extend everywhere in space, and would thereby "disturb and retard the Motions of those great Bodies" (the planets and comets) and thus "as it [light's medium] is of no use, and hinders the Operation of Nature, and makes her languish, so there is no evidence for its Existence, and therefore it ought to be rejected". In 1720, James Bradley carried out a series of experiments attempting to measure stellar parallax by taking measurements of stars at different times of the year. As the Earth moves around the sun, the apparent angle to a given distant spot changes. By measuring those angles the distance to the star can be calculated based on the known orbital circumference of the Earth around the sun. He failed to detect any parallax, thereby placing a lower limit on the distance to stars. During these experiments, Bradley also discovered a related effect; the apparent positions of the stars did change over the year, but not as expected. Instead of the apparent angle being maximized when the Earth was at either end of its orbit with respect to the star, the angle was maximized when the Earth was at its fastest sideways velocity with respect to the star. This effect is now known as stellar aberration. Bradley explained this effect in the context of Newton's corpuscular theory of light, by showing that the aberration angle was given by simple vector addition of the Earth's orbital velocity and the velocity of the corpuscles of light, just as vertically falling raindrops strike a moving object at an angle. Knowing the Earth's velocity and the aberration angle, this enabled him to estimate the speed of light. Explaining stellar aberration in the context of an aether-based theory of light was regarded as more problematic. As the aberration relied on relative velocities, and the measured velocity was dependent on the motion of the Earth, the aether had to be remaining stationary with respect to the star as the Earth moved through it. This meant that the Earth could travel through the aether, a physical medium, with no apparent effect – precisely the problem that led Newton to reject a wave model in the first place. A century later, Thomas Young and Augustin-Jean Fresnel revived the wave theory of light when they pointed out that light could be a transverse wave rather than a longitudinal wave – the polarization of a transverse wave (like Newton's "sides" of light) could explain birefringence, and in the wake of a series of experiments on diffraction the particle model of Newton was finally abandoned. Physicists assumed, moreover, that like mechanical waves, light waves required a medium for propagation, and thus required Huygens's idea of an aether "gas" permeating all space. However, a transverse wave apparently required the propagating medium to behave as a solid, as opposed to a gas or fluid. The idea of a solid that did not interact with other matter seemed a bit odd, and Augustin-Louis Cauchy suggested that perhaps there was some sort of "dragging", or "entrainment", but this made the aberration measurements difficult to understand. He also suggested that the absence of longitudinal waves suggested that the aether had negative compressibility. George Green pointed out that such a fluid would be unstable. George Gabriel Stokes became a champion of the entrainment interpretation, developing a model in which the aether might be (by analogy with pine pitch) rigid at very high frequencies and fluid at lower speeds. Thus the Earth could move through it fairly freely, but it would be rigid enough to support light. In 1856, Wilhelm Eduard Weber and Rudolf Kohlrausch measured the numerical value of the ratio of the electromagnetic unit of charge to the electrostatic unit of charge. They found that the ratio equals the product of the speed of light and the square root of two. The following year, Gustav Kirchhoff wrote a paper in which he showed that the speed of a signal along an electric wire was equal to the speed of light. These are the first recorded historical links between the speed of light and electromagnetic phenomena. Maxwell had, however, expressed some uncertainties surrounding the precise nature of his molecular vortices and so he began to embark on a purely dynamical approach to the problem. He wrote another paper in 1864, entitled "A Dynamical Theory of the Electromagnetic Field", in which the details of the luminiferous medium were less explicit. [A 2] Although Maxwell did not explicitly mention the sea of molecular vortices, his derivation of Ampère's circuital law was carried over from the 1861 paper and he used a dynamical approach involving rotational motion within the electromagnetic field which he likened to the action of flywheels. Using this approach to justify the electromotive force equation (the precursor of the Lorentz force equation), he derived a wave equation from a set of eight equations which appeared in the paper and which included the electromotive force equation and Ampère's circuital law. [A 2] Maxwell once again used the experimental results of Weber and Kohlrausch to show that this wave equation represented an electromagnetic wave that propagates at the speed of light, hence supporting the view that light is a form of electromagnetic radiation. The apparent need for a propagation medium for such Hertzian waves can be seen by the fact that they consist of orthogonal electric (E) and magnetic (B or H) waves. The E waves consist of undulating dipolar electric fields, and all such dipoles appeared to require separated and opposite electric charges. Electric charge is an inextricable property of matter, so it appeared that some form of matter was required to provide the alternating current that would seem to have to exist at any point along the propagation path of the wave. Propagation of waves in a true vacuum would imply the existence of electric fields without associated electric charge, or of electric charge without associated matter. Albeit compatible with Maxwell's equations, electromagnetic induction of electric fields could not be demonstrated in vacuum, because all methods of detecting electric fields required electrically charged matter. In addition, Maxwell's equations required that all electromagnetic waves in vacuum propagate at a fixed speed, c. As this can only occur in one reference frame in Newtonian physics (see Galilean-Newtonian relativity), the aether was hypothesized as the absolute and unique frame of reference in which Maxwell's equations hold. That is, the aether must be "still" universally, otherwise c would vary along with any variations that might occur in its supportive medium. Maxwell himself proposed several mechanical models of aether based on wheels and gears, and George Francis FitzGerald even constructed a working model of one of them. These models had to agree with the fact that the electromagnetic waves are transverse but never longitudinal. Aethers were invented for the planets to swim in, to constitute electric atmospheres and magnetic effluvia, to convey sensations from one part of our bodies to another, and so on, until all space had been filled three or four times over with aethers. ... The only aether which has survived is that which was invented by Huygens to explain the propagation of light. Contemporary scientists were aware of the problems, but aether theory was so entrenched in physical law by this point that it was simply assumed to exist. In 1908 Oliver Lodge gave a speech on behalf of Lord Rayleigh  to the Royal Institution on this topic, in which he outlined its physical properties, and then attempted to offer reasons why they were not impossible. Nevertheless, he was also aware of the criticisms, and quoted Lord Salisbury as saying that "aether is little more than a nominative case of the verb to undulate". Others criticized it as an "English invention", although Rayleigh jokingly stated it was actually an invention of the Royal Institution. That is, movement adds only a fraction of the medium's velocity to the light (predicted by Fresnel in order to make Snell's law work in all frames of reference, consistent with stellar aberration). This was initially interpreted to mean that the medium drags the aether along, with a portion of the medium's velocity, but that understanding became very problematic after Wilhelm Veltmann demonstrated that the index n in Fresnel's formula depended upon the wavelength of light, so that the aether could not be moving at a wavelength-independent speed. This implied that there must be a separate aether for each of the infinitely many frequencies. The key difficulty with Fresnel's aether hypothesis arose from the juxtaposition of the two well-established theories of Newtonian dynamics and Maxwell's electromagnetism. Under a Galilean transformation the equations of Newtonian dynamics are invariant, whereas those of electromagnetism are not. Basically this means that while physics should remain the same in non-accelerated experiments, light would not follow the same rules because it is travelling in the universal "aether frame". Some effect caused by this difference should be detectable. A simple example concerns the model on which aether was originally built: sound. The speed of propagation for mechanical waves, the speed of sound, is defined by the mechanical properties of the medium. Sound travels 4.3 times faster in water than in air. This explains why a person hearing an explosion underwater and quickly surfacing can hear it again as the slower travelling sound arrives through the air. Similarly, a traveller on an airliner can still carry on a conversation with another traveller because the sound of words is travelling along with the air inside the aircraft. This effect is basic to all Newtonian dynamics, which says that everything from sound to the trajectory of a thrown baseball should all remain the same in the aircraft flying (at least at a constant speed) as if still sitting on the ground. This is the basis of the Galilean transformation, and the concept of frame of reference. Thus at any point there should be one special coordinate system, "at rest relative to the aether". Maxwell noted in the late 1870s that detecting motion relative to this aether should be easy enough—light travelling along with the motion of the Earth would have a different speed than light travelling backward, as they would both be moving against the unmoving aether. Even if the aether had an overall universal flow, changes in position during the day/night cycle, or over the span of seasons, should allow the drift to be detected. 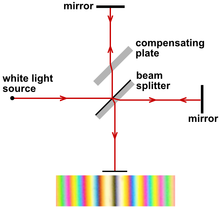 The Michelson–Morley experiment compared the time for light to reflect from mirrors in two orthogonal directions. While the first-order experiments could be explained by a modified stationary aether, more precise second-order experiments were expected to give positive results, however, no such results could be found. The famous Michelson–Morley experiment compared the source light with itself after being sent in different directions, looking for changes in phase in a manner that could be measured with extremely high accuracy. In this experiment, their goal was to determine the velocity of the Earth through the aether. [E 19][E 20] The publication of their result in 1887, the null result, was the first clear demonstration that something was seriously wrong with the aether hypothesis (Michelson's first experiment in 1881 was not entirely conclusive). In this case the MM experiment yielded a shift of the fringing pattern of about 0.01 of a fringe, corresponding to a small velocity. However, it was incompatible with the expected aether wind effect due to the Earth's (seasonally varying) velocity which would have required a shift of 0.4 of a fringe, and the error was small enough that the value may have indeed been zero. Therefore, the null hypothesis, the hypothesis that there was no aether wind, could not be rejected. More modern experiments have since reduced the possible value to a number very close to zero, about 10−17. It is obvious from what has gone before that it would be hopeless to attempt to solve the question of the motion of the solar system by observations of optical phenomena at the surface of the earth. —  A. Michelson and E. Morley. "On the Relative Motion of the Earth and the Luminiferous Æther". Phil. Mag. S. 5. Vol. 24. No. 151. Dec. 1887. A series of experiments using similar but increasingly sophisticated apparatuses all returned the null result as well. Conceptually different experiments that also attempted to detect the motion of the aether were the Trouton–Noble experiment (1903),[E 21] whose objective was to detect torsion effects caused by electrostatic fields, and the experiments of Rayleigh and Brace (1902, 1904),[E 22][E 23] to detect double refraction in various media. However, all of them obtained a null result, like Michelson–Morley (MM) previously did. These "aether-wind" experiments led to a flurry of efforts to "save" aether by assigning to it ever more complex properties, while only few scientists, like Emil Cohn or Alfred Bucherer, considered the possibility of the abandonment of the aether hypothesis. Of particular interest was the possibility of "aether entrainment" or "aether drag", which would lower the magnitude of the measurement, perhaps enough to explain the results of the Michelson-Morley experiment. However, as noted earlier, aether dragging already had problems of its own, notably aberration. In addition, the interference experiments of Lodge (1893, 1897) and Ludwig Zehnder (1895), aimed to show whether the aether is dragged by various, rotating masses, showed no aether drag. [E 24][E 25][E 26] A more precise measurement was made in the Hammar experiment (1935), which ran a complete MM experiment with one of the "legs" placed between two massive lead blocks. [E 27] If the aether was dragged by mass then this experiment would have been able to detect the drag caused by the lead, but again the null result was achieved. The theory was again modified, this time to suggest that the entrainment only worked for very large masses or those masses with large magnetic fields. This too was shown to be incorrect by the Michelson–Gale–Pearson experiment, which detected the Sagnac effect due to Earth's rotation (see Aether drag hypothesis). Similarly the Sagnac effect, observed by G. Sagnac in 1913, was immediately seen to be fully consistent with special relativity. [E 29][E 30] In fact, the Michelson-Gale-Pearson experiment in 1925 was proposed specifically as a test to confirm the relativity theory, although it was also recognized that such tests, which merely measure absolute rotation, are also consistent with non-relativistic theories. Since the Miller experiment and its unclear results there have been many more experimental attempts to detect the aether. Many experimenters have claimed positive results. These results have not gained much attention from mainstream science, since they contradict a large quantity of high-precision measurements, all the results of which were consistent with special relativity. Aether theory was dealt another blow when the Galilean transformation and Newtonian dynamics were both modified by Albert Einstein's special theory of relativity, giving the mathematics of Lorentzian electrodynamics a new, "non-aether" context. [A 18] Unlike most major shifts in scientific thought, special relativity was adopted by the scientific community remarkably quickly, consistent with Einstein's later comment that the laws of physics described by the Special Theory were "ripe for discovery" in 1905. [B 10] Max Planck's early advocacy of the special theory, along with the elegant formulation given to it by Hermann Minkowski, contributed much to the rapid acceptance of special relativity among working scientists. Einstein based his theory on Lorentz's earlier work. Instead of suggesting that the mechanical properties of objects changed with their constant-velocity motion through an undetectable aether, Einstein proposed to deduce the characteristics that any successful theory must possess in order to be consistent with the most basic and firmly established principles, independent of the existence of a hypothetical aether. He found that the Lorentz transformation must transcend its connection with Maxwell's equations, and must represent the fundamental relations between the space and time coordinates of inertial frames of reference. In this way he demonstrated that the laws of physics remained invariant as they had with the Galilean transformation, but that light was now invariant as well. With the development of the special theory of relativity, the need to account for a single universal frame of reference had disappeared – and acceptance of the 19th century theory of a luminiferous aether disappeared with it. For Einstein, the Lorentz transformation implied a conceptual change: that the concept of position in space or time was not absolute, but could differ depending on the observer's location and velocity. In later years there have been a few individuals who advocated a neo-Lorentzian approach to physics, which is Lorentzian in the sense of positing an absolute true state of rest that is undetectable and which plays no role in the predictions of the theory. (No violations of Lorentz covariance have ever been detected, despite strenuous efforts.) Hence these theories resemble the 19th century aether theories in name only. For example, the founder of quantum field theory, Paul Dirac, stated in 1951 in an article in Nature, titled "Is there an Aether?" that "we are rather forced to have an aether". [A 20] However, Dirac never formulated a complete theory, and so his speculations found no acceptance by the scientific community. When Einstein was still a student in the Zurich Polytechnic in 1900, he was very interested in the idea of aether. His initial proposal of research thesis was to do an experiment to measure how fast the Earth was moving through the aether. "The velocity of a wave is proportional to the square root of the elastic forces which cause [its] propagation, and inversely proportional to the mass of the aether moved by these forces." ^ "Google Scholar "luminiferous ether"". ^ "Google Books "luminiferous ether"". ^ The 19th century science book A Guide to the Scientific Knowledge of Things Familiar provides a brief summary of scientific thinking in this field at the time. ^ Robert Boyle, The Works of the Honourable Robert Boyle, ed. Thomas Birch, 2nd edn., 6 vols. (London, 1772), III, 316; quoted in E.A. Burtt, The Metaphysical Foundations of Modern Science (Garden City, New York: Doubleday & Company, 1954), 191-192. ^ "Rayleigh & Lodge on the Ether of Space - Keelynet - 06/26/00". www.keelynet.com. Archived from the original on 13 September 2017. Retrieved 30 April 2018. ^ "Selected Papers of Great American Physicists" (PDF). www.aip.org. Archived (PDF) from the original on 15 July 2015. Retrieved 30 April 2018. ^ They commented in a footnote: "From [the Michelson–Morley] experiment it is not inferred that the velocity of the earth is but a few kilometers per second, but rather that the dimensions of the apparatus vary very nearly as required by relativity. From the present experiment we similarly infer that the frequency of light varies conformably to the theory." ^ The confusion over this point can be seen in Sagnac's conclusion that "in the ambient space, light is propagated with a velocity V0, independent of the movement as a whole of the luminous source O and the optical system. That is a property of space which experimentally characterizes the luminiferous aether." The invariance of light speed, independent of the movement of the source, is also one of the two fundamental principles of special relativity. ^ Lorentz wrote: "One cannot deny to the bearer of these properties a certain substantiality, and if so, then one may, in all modesty, call true time the time measured by clocks which are fixed in this medium, and consider simultaneity as a primary concept." However, he went on to say that this was based on his conception of "infinite velocity", which according to his own theory is not physically realizable. Lorentz also admitted that the postulate of an absolute but undetectable rest frame was purely metaphysical, and had no empirical consequences. ^ Dirac wrote about his theory: "We have now the velocity at all points of space-time, playing a fundamental part in electrodynamics. It is natural to regard it as the velocity of some real physical thing. Thus with the new theory of electrodynamics we are rather forced to have an aether." ^ Isaacson, Walter (2007). Einstein: His life and Universe. New York: Simon & Schuster. pp. 47–48. ^ Einstein 1920: We may say that according to the general theory of relativity space is endowed with physical qualities; in this sense, therefore, there exists an aether. According to the general theory of relativity space without aether is unthinkable; for in such space there not only would be no propagation of light, but also no possibility of existence for standards of space and time (measuring-rods and clocks), nor therefore any space-time intervals in the physical sense. But this aether may not be thought of as endowed with the quality characteristic of ponderable media, as consisting of parts which may be tracked through time. The idea of motion may not be applied to it. ^ a b c Newton, Isaac: Opticks (1704). Fourth edition of 1730. (Republished 1952 (Dover: New York), with commentary by Bernard Cohen, Albert Einstein, and Edmund Whittaker). ^ a b Maxwell, JC (1865). "A Dynamical Theory of the Electromagnetic Field (Part 1)" (PDF). Archived (PDF) from the original on 2011-07-28. ^ Fresnel, A. (1818). "Lettre d'Augustin Fresnel à François Arago sur l'influence du mouvement terrestre dans quelques phénomènes d'optique". Annales de Chimie et de Physique. 9: 57–66. ^ G. G. Stokes (1845). "On the Aberration of Light". Philosophical Magazine. 27 (177): 9–15. doi:10.1080/14786444508645215. ^ Poincaré, Henri (1900), "La théorie de Lorentz et le principe de réaction" , Archives Néerlandaises des Sciences Exactes et Naturelles, 5: 252–278 . See also the English translation Archived 2008-06-26 at the Wayback Machine. ^ Einstein, Albert (1905a), "Zur Elektrodynamik bewegter Körper", Annalen der Physik, 322 (10): 891–921, Bibcode:1905AnP...322..891E, doi:10.1002/andp.19053221004 . See also: English translation Archived 2005-11-25 at the Wayback Machine. ^ Dirac, P. M. (1951). "Is there an Aether?" (PDF). Nature. 168 (4282): 906. Bibcode:1951Natur.168..906D. doi:10.1038/168906a0. Archived from the original (PDF) on 17 December 2008. Retrieved 23 February 2017. ^ Fizeau, H. (1851). "The Hypotheses Relating to the Luminous Aether, and an Experiment which Appears to Demonstrate that the Motion of Bodies Alters the Velocity with which Light Propagates itself in their Interior" . Philosophical Magazine. 2: 568–573. ^ Michelson, A. A. & Morley, E.W. (1886). "Influence of Motion of the Medium on the Velocity of Light" . Am. J. Sci. 31 (185): 377–386. Bibcode:1886AmJS...31..377M. doi:10.2475/ajs.s3-31.185.377. ^ Arago, A. (1810–1853). "Mémoire sur la vitesse de la lumière, lu à la prémière classe de l'Institut, le 10 décembre 1810". Comptes Rendus de l'Académie des Sciences. 36: 38–49. ^ Airy, G.B. (1871). "On the Supposed Alteration in the Amount of Astronomical Aberration of Light, Produced by the Passage of the Light through a Considerable Thickness of Refracting Medium". Proceedings of the Royal Society. 20 (130–138): 35–39. Bibcode:1871RSPS...20...35A. doi:10.1098/rspl.1871.0011. Archived from the original on 2012-05-15. ^ a b Mascart, E. (1872). "Sur les modifications qu'éprouve la lumière par suite du mouvement de la source lumineuse et du mouvement de l'observateur". Annales Scientifiques de l'École Normale Supérieure. Série 2. 1: 157–214. doi:10.24033/asens.81. Archived from the original on 2011-08-07. ^ Fizeau, H. (1861). "Ueber eine Methode, zu untersuchen, ob das Polarisationsazimut eines gebrochenen Strahls durch die Bewegung des brechenden Körpers geändert werde". Annalen der Physik. 190 (12): 554–587. Bibcode:1861AnP...190..554F. doi:10.1002/andp.18621901204. Archived from the original on 2012-05-15. ^ Brace, D.B. (1905). "The Aether "Drift" and Rotary Polarization". Philosophical Magazine. 10 (57): 383–396. doi:10.1080/14786440509463384. ^ Strasser, B. (1907). "Der Fizeausche Versuch über die Änderung des Polarisationsazimuts eines gebrochenen Strahles durch die Bewegung der Erde". Annalen der Physik. 329 (11): 137–144. Bibcode:1907AnP...329..137S. doi:10.1002/andp.19073291109. Archived from the original on 2012-05-15. ^ Hoek, M. (1868). "Determination de la vitesse avec laquelle est entrainée une onde lumineuse traversant un milieu en mouvement". Verslagen en Mededeelingen. 2: 189–194. ^ Klinkerfues, Ernst Friedrich Wilhelm (1870). "Versuche über die Bewegung der Erde und der Sonne im Aether". Astronomische Nachrichten. 76 (3): 33–38. Bibcode:1870AN.....76...33K. doi:10.1002/asna.18700760302. ^ Haga, H. (1902). "Über den Klinkerfuesschen Versuch". Physikalische Zeitschrift. 3: 191. ^ Ketteler, Ed. (1872). "Ueber den Einfluss der astronomischen Bewegungen auf die optischen Erscheinungen". Annalen der Physik. 220 (9): 109–127. Bibcode:1871AnP...220..109K. doi:10.1002/andp.18712200906. Archived from the original on 2012-05-15. ^ a b Mascart, E. (1874). "Sur les modifications qu'éprouve la lumière par suite du mouvement de la source lumineuse et du mouvement de l'observateur (deuxième partie)". Annales Scientifiques de l'École Normale Supérieure. Série 2. 3: 363–420. doi:10.24033/asens.118. ^ Lord Rayleigh (1902). "Is Rotatory Polarization Influenced by the Earth's Motion?". Philosophical Magazine. 4 (20): 215–220. doi:10.1080/14786440209462836. ^ Röntgen, W. (1888). "Über die durch Bewegung eines im homogenen elektrischen Felde befindlichen Dielektricums hervorgerufene elektrodynamische Kraft". Berliner Sitzungsberichte. 2. Halbband: 23–28. Archived from the original on 2016-02-26. ^ Des Coudres, Th. (1889). "Ueber das Verhalten des Lichtäthers bei den Bewegungen der Erde". Annalen der Physik. 274 (9): 71–79. Bibcode:1889AnP...274...71D. doi:10.1002/andp.18892740908. ^ Königsberger, J. (1905). "Induktionswirkung im Dielektrikum und Bewegung des Aethers". Berichte der Naturforschenden Gesellschaft zu Freiburg I. Br. 13: 95–100. ^ Trouton, F.T. (1902). "The results of an electrical experiment, involving the relative motion of the Earth and the Ether, Suggested by the Late Professor FitzGerald". Transactions of the Royal Dublin Society. 7: 379–384. ^ Trouton, F. T.; Noble, H. R. (1903). "The Mechanical Forces Acting on a Charged Electric Condenser Moving through Space". Philosophical Transactions of the Royal Society A. 202 (346–358): 165–181. Bibcode:1904RSPTA.202..165T. doi:10.1098/rsta.1904.0005. Archived from the original on 2012-05-15. ^ Lord Rayleigh (1902). "Does Motion through the Aether cause Double Refraction?" . Philosophical Magazine. 4 (24): 678–683. doi:10.1080/14786440209462891. ^ Brace, DeWitt Bristol (1904). "On Double Refraction in Matter moving through the Aether" . Philosophical Magazine. 7 (40): 317–329. doi:10.1080/14786440409463122. ^ Lodge, Oliver J. (1893). "Aberration Problems". Philosophical Transactions of the Royal Society A. 184: 727–804. Bibcode:1893RSPTA.184..727L. doi:10.1098/rsta.1893.0015. Archived from the original on 2016-01-24. ^ Lodge, Oliver J. (1897). "Experiments on the Absence of Mechanical Connexion between Ether and Matter" . Philosophical Transactions of the Royal Society A. 189: 149–166. Bibcode:1897RSPTA.189..149L. doi:10.1098/rsta.1897.0006. ^ Zehnder, L. (1895). "Ueber die Durchlässigkeit fester Körper für den Lichtäther". Annalen der Physik. 291 (5): 65–81. Bibcode:1895AnP...291...65Z. doi:10.1002/andp.18952910505. ^ G. W. Hammar (1935). "The Velocity of Light Within a Massive Enclosure". Physical Review. 48 (5): 462–463. Bibcode:1935PhRv...48..462H. doi:10.1103/PhysRev.48.462.2. ^ Kennedy, R. J.; Thorndike, E. M. (1932). "Experimental Establishment of the Relativity of Time". Physical Review. 42 (3): 400–418. Bibcode:1932PhRv...42..400K. doi:10.1103/PhysRev.42.400. ^ Wien, Wilhelm (1898). "Über die Fragen, welche die translatorische Bewegung des Lichtäthers betreffen (Referat für die 70. Versammlung deutsche Naturforscher und Aerzte in Düsseldorf, 1898)" . Annalen der Physik. 301 (3): I–XVIII. .
^ Laub, Jakob (1910). "Über die experimentellen Grundlagen des Relativitätsprinzips". Jahrbuch der Radioaktivität und Elektronik. 7: 405–463. ^ a b Stachel, J. (2001), "Why Einstein reinvented the ether", Physics World, 14 (6): 55–56, doi:10.1088/2058-7058/14/6/33. ^ a b c Kostro, L. (2001), "Albert Einstein's New Ether and his General Relativity" (PDF), Proceedings of the Conference of Applied Differential Geometry: 78–86, archived (PDF) from the original on 2018-04-11. Wikimedia Commons has media related to Luminiferous aether. Harry Bateman (1915) The Structure of the Aether, Bulletin of the American Mathematical Society 21(6):299–309. Decaen, Christopher A. (2004), "Aristotle's Aether and Contemporary Science", The Thomist, 68 (3): 375–429, doi:10.1353/tho.2004.0015, retrieved 2011-03-05.